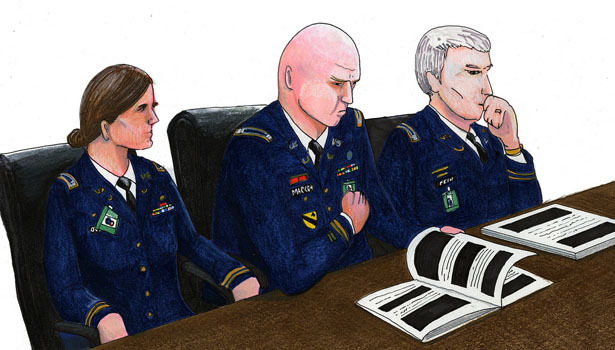 What Is in Bradley Manning’s Leaks, Anyway? Courtroom action is adjourned until next Monday, June 10, giving us a chance to pause and take a good look at what this court-martial is really all about: the leaks themselves. Too often, the content of the leaks—thousands of stories of individual lives destroyed or damaged by war—gets subsumed in the drama surrounding the leaks—Manning, Assange, Wikileaks and their travails. Michael Arria at Vice Motherboard has an excellent analysis of this tendency to overlook the leaks’ content, including a good brisk run-down of some of the major leaks, lest we forget. Reading this leaked material is not a privilege, and it’s more than a right: it is an obligation, the duty of any American with access to an internet signal and a browser. If we ever want a foreign policy that serves the interests of the 99 percent, step one is to put on a pot of coffee or crack open a beer and read up on your Wikileaks! Do you think Bradley Manning would be better off in civilian court?